When they found it, they knew what they had to do. 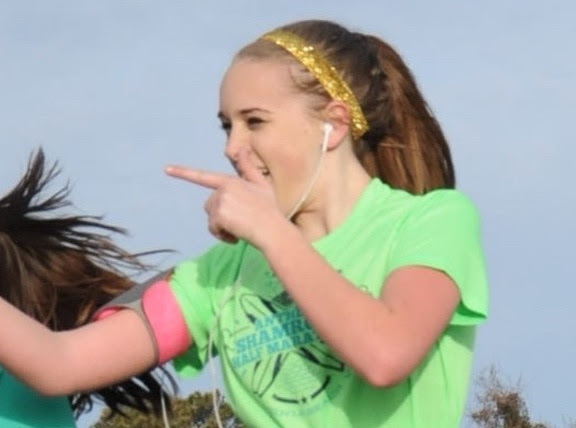 For the Gallagher family, weeks after Cameron ran her last mile in life they were still searching for explanations on to why she did not come home and was not there in her room after finishing her race at the Shamrock Half Marathon on March 16th, 2014. Cameron was searching for answers and doing something about it as she fought depression as her opponent was herself; yet what stands out to me about her and the Mission at Mile 12 is how steadfast she was about honoring herself. As she fought the good fight, and worked quietly on her plans to SpeakUp, she chose to be honest with herself even if it hurt, and run to who she was rather than from it. And when it comes to ourselves, shouldn’t we all. To honor yourself, why is it important? What I have experienced is that when we give in to the tendency, personally or professionally, to try to gain others attention or respect we people please. The result? Rather than be the ‘real you’ you become the you that has accommodated to others wants and needs. It is evident that Cameron was not about to be someone she was not nor do things that did not honor herself. Knowing she was a teenager when confronting this makes me realize how hard this must have been for her, and the resilience and strength she had by being open about it and vulnerable. The fleet of passing time and opportunities, we all face them and ultimately can only answer for ourselves. Whether we are 25, 45, or 75, we all have to look at how we spend our lives. One of the ways I have come to appreciate and reflect on it is through a run, as life can be seen as a series of runs. I know there is a finish line, I just can’t see it until the end. The pain to get there may be greater on the inside then I am showing on the outside, and I can decide to quit or press on and finish the race. When I have Run As One with others in my life, I know I can face anything. In fact, seeing as my memory will fade, one of the way I honored myself through my seven year run of being a single parent was by writing a letter to myself in 10 years, as I know I will want to look back at that time in my life. By saying and living out that it’s OK to not be OK, Cameron honored herself, and as I think about how she fought her depression to train for her last run, what does honoring yourself mean? We only have so much time, and honoring ourselves is worth that time. The song by Five for Fighting tells a story, as songwriter John Ondrasik faces himself through the years. Life is a treasure, sink in every moment. I will be doing just that running for Cameron where she ran her last mile, with the sunrise along the Virginia coast.